Chronic, non-healing wounds affects around 6.5 million people, which is nearly 2 percent of the general population, putting a huge strain on patients, health care professionals and the health care system. Managing these patients’ wounds costs over $50 billion per year. Mediaplanet’s cross-platform edition of “Wound Care” sheds light on the advancements that are allowing people with wounds to lead better lives, proving that this secondary problem requires first-priority attention. Chronic wounds keep more than 6 million Americans from doing what they love to do. Increased awareness and early detection of chronic wounds can reduce the potential for infection, hospitalization and amputation. With the crossover of many disease states complicating the understanding of high-risk wounds, encouraging the development of new therapies that treats different types of wounds in different phases remains a challenge researchers and health care professionals are working towards. The print component of “Wound Care” is distributed within this weekend’s edition of USA Today in New York, South Florida, Chicago, Boston, Houston and Dallas with a circulation of approximately 250,000 copies and an estimated readership of 750,000. The digital component is distributed nationally, through a vast social media strategy, and across a network of top news sites and partner outlets. To explore the digital version of the campaign, click here. 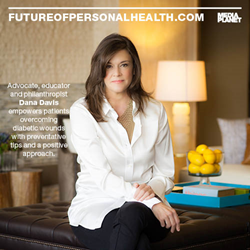 Educator, advocate and philanthropist, Dana Davis, graces the cover of the print publication. In an exclusive interview with Mediaplanet, she shares her personal experiences with Type 1 diabetes and the nearly 60 foot wounds she suffered as a result. She emphasizes how effective patient-to-physician communication has been critical throughout her journey with foot wounds. This edition of “Wound Care” was made possible with the support of the Association for the Advancement of Wound Care, Smith & Nephew, American Podiatric Medical Association, Dana Davis, Integra Life Sciences, Wound, Ostomy & Continence Nurses Society, Wound Care Education Institute, American Association of Diabetes Educators and many more.